Brussels sprouts is one of the most unpretentious plants. It can grow on poor soils and does not require constant care. Moreover, it is very useful. In this cabbage contains twice more vitamin C than conventional, also includes potassium and calcium. Cabbage is ideal for people who are watching their weight. But to get excellent harvest, the wonder vegetable, you will have to put in a little effort. A few tips on caring for it will help to reduce these efforts to a minimum. Brussels sprouts are grown seedling method. From germination to emergence kochanchikov takes about 150 days. To sow the seedlings better in the beginning of April. Can be sown seedlings in the flat, with good light and relatively cool daytime temperatures and warm in the Lodge or in a heated greenhouse. Visivite seeds at 1 cm depth, about four inches from each other. When the plant will be one piece, it is time to raspikirovat in a separate Cup. 50-day age cabbage can be planted in the open ground. Because the sprouts need a lot of space, then you need to plant far enough, about 50 cm from other plants. Care cabbage is regular watering and weekly fertilizing and hilling. Feeding infusion of mullein and fertilizer should be alternated. Of fertilizers you can use azofoska – 10 liters of water take 3 tbsp. Not bad for a cabbage suitable fertilizer containing nitrogen and potassium. Due to the fact that cabbage is a tall stalk during the entire vegetation period it is necessary to constantly Spud and loosen. Once the lower head reached the size of a pea, tear off the top of the plant. This will allow faster to fill the heads. You can leave the plant up to full maturation until late autumn, as this cabbage can withstand freezing down to -8 degrees. As soon as the heads become dense, they pluck. Needed to cut the cabbage around the stalk, otherwise they can crumble. Kochanchiki better not to keep fresh, usually frozen. In this way they perfectly retain their useful properties and taste. To eat cabbage can and is boiled, and roasted, and as a side dish or soup. When cooking Brussels sprouts, it is important not to overcook it - over processing will destroy all the beneficial properties of the vegetable. Due to the fact that Brussels sprouts need about 150 days to ready kochanchikov (since germination), without plants, as a rule, not do. The best time for planting seedlings is considered the first of April. Seedlings can grow on the glazed balcony, indoors, on the balcony or in the heated greenhouse. Culture maintains frosts up to -10...-8 °C, i.e. more cold-hardy than cabbage. For her, the optimum temperature of 15-18 °C, at 25 and above in the shading delayed the formation of plants and reduces crop quality. Brussels sprouts sow from 10 to 15 April in well-lit, sun-heated space under the film, and seedlings are planted from 1 to 10 June the garden bed where you grew tomatoes, cucumbers or beans. Brussels sprouts, and whose small Lennie leaf buds so resemble miniature heads of cabbage, rich in protein, fiber, vitamins and minerals, and antioxidants. 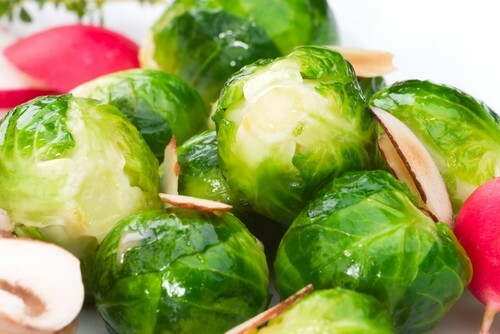 With a unique low-calorie 100 grams of product only 45 calories Brussel sprouts contain many vitamins and minerals. Vitamin K, which is in the same serving of cabbage 275% of the daily value, promotes healthy bones, prevents calcification of tissues and serves as an antioxidant and anti-inflammatory agent. This vitamin is vital for brain and nerve cells. Daily consumption of vitamin K helps limit neuronal damage in the brain and, if not prevent, then at least a few stunts the development of Alzheimer's disease. 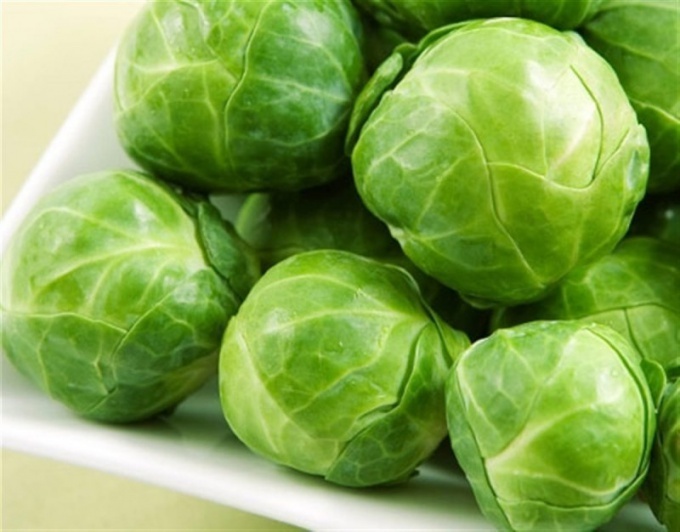 Vitamin C along with other antioxidant vitamins that are present in Brussels sprouts, such as A and E, protects the body. It also lowers blood pressure and struggling with toxic lead that can be contained even in consumer products. Antioxidants "stop" free radicals, leading to such diseases as atherosclerosis, heart disease, strokes and cancer. Vitamin a boosts immunity, protects eyes against cataracts and macular degeneration, helps to maintain healthy teeth and bones, plays an important role in the health of reproductive organs and fights with stones in the bladder. 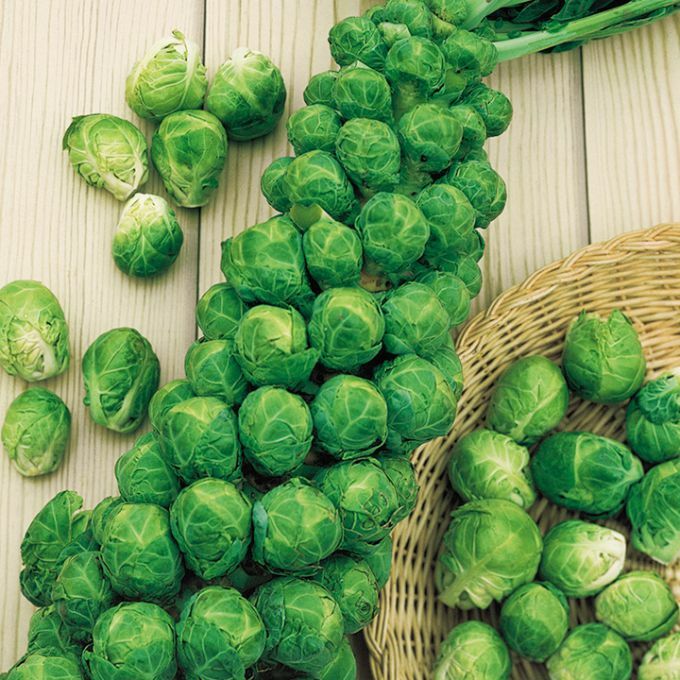 The b vitamins contained in Brussels sprouts, is essential for the metabolism. In Brussels sprouts also contain copper, calcium, manganese and phosphorus. Potassium that is 100 grams of Brussels sprouts, about 289 mg, is an important component of cell body fluids that helps control heart rate and blood pressure. Iron, which is also in this kind of cabbage, it is necessary for the formation of red blood cells. Brussels sprouts can not only be boiled, fried or baked, but raw. Brussels sprouts are often recommended for those who are dieting. High fiber content in this vegetable about 4 grams per serving of 100 grams, not only helps digestion but also lowers cholesterol. Fiber also prevents constipation and prevents overeating. The fiber in Brussels sprouts discovered sulforaphane and glucoraphanin, which protects the gastric mucosa, inhibiting the growth of helicobacteria, leading to cancer of the stomach. Brussels sprouts is recommended for pregnant women. This is due to the high content in vegetable folate, which is crucial in the prevention of birth defects novorojdennih such as spina bifida and neural tube defects. Studies have also shown that lack of folic acid leads to accumulation of homocysteine, significantly increasing the risk of cardiovascular disease, promote ateroscleroza and the formation of blood clots. Everyone has seen the store mostly frozen small green or red cabbages with a diameter of 3-4 cm, and most likely everyone tried Brussels sprouts and were amazed by the great taste. Saw tried, now we have to grow and stock up on this wonderful cabbage for the winter, it can freeze, salted, canned, Yes what your heart desires. In Brussels sprouts have potassium and magnesium, 6, iron, phosphorus. For pregnant women this product simply no substitute, as it contains a lot of folic acid. It lowers cholesterol, improves vision, helps with constipation, prevents breast cancer. After reading all of the beneficial properties, you just need to grow it in his garden, because conventional Kale is grown, and is the same as cabbage, only it looks very original. So, in conditions of the Siberian climate, to plant Brussels sprouts in the garden seedlings, not seeds. Plant seeds in peat pots, somewhere in mid-April (sooner is not necessary, as still in Siberia, the time of sowing is later than in warmer areas) covered with a film or glass and put it on the window sill the light it needs. In the open ground planted in late may or early June, the place should be Sunny, as the shadow at the growth of cabbages may slow down or even stop. The distance between plants should be 50-70 cm, cover it in the beginning, and then when strong temperature decrease, and it is cold-resistant plant. It can withstand frosts down to minus 7. Each stem grows to 80 small heads, they need to gather to start at the bottom, you will see for yourself when they are ready, they will become shiny and elastic. Like other types of cabbage, it needs constant watering. Feed you 2 times no more an excess of fertilizer the heads will become loose and will lose all its taste. Harvest in late September, but could stand until November, but in Siberia, high to mid-October, when the weather is nice until the end. Basically Brussels sprouts freeze, but it can also be preserved. You can cook wonderful soups, puree, saute, add to a vegetable stew, experiment and enjoy.